Formed by a dam on the Madison River, Ennis Lake is a locals’ and tourists’ favorite for water sports, fishing, and wildlife watching. Ennis Lake provides fish this size throughout the year. Some days on dry flies, others nymphs and streamers. 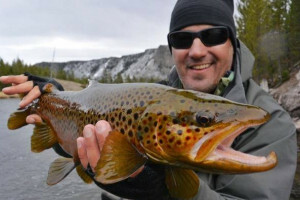 Want a chance at a fish of this magnitude, give us a call. With 79 years experience guiding and educating anglers around Ennis, we help put them into fish in every nearby waterway. Come into our store for Ennis Lake advice & gear. 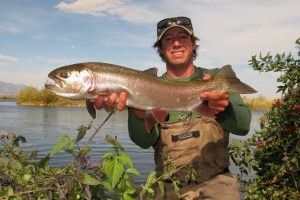 Bring your tent, trailer or RV and enjoy close proximity to Ennis Lake, one of the best big-fish reservoirs in Montana. 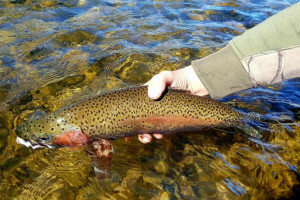 Early spring and late-fall are best times for fishing. Select from rental homes and cabins around the Ennis Lake and the Madison Valley, many with riverfront locations. All are well-maintained and have modern amenities. Why not rent one of our Jeep Wranglers with fly-rod rack attachment as you make your way through Ennis and the surrounding waterways. They hold a lot of gear. Ennis Lake is accessible year round. The Lake is located 10 miles northeast of the town of Ennis. Ennis Lake is shallow allowing the water to be warmer than expected during the summer months. 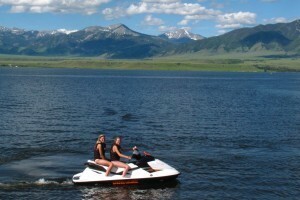 On the Lake and in the area, you can enjoy fishing, water sports, and wildlife watching. 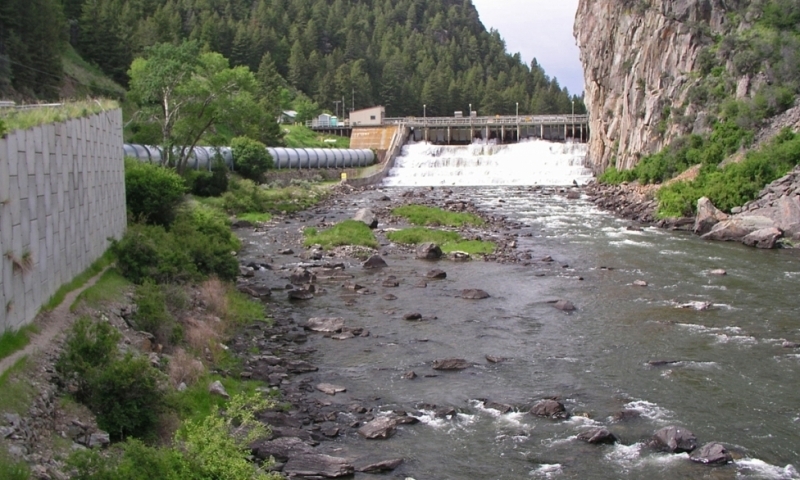 Known by longtime locals as Meadow Lake ( the Forest Service renamed it long ago), Ennis Lake was formed in 1905 when Montana Power built a dam on the Madison River at the head of the Bear Trap Canyon. The lake is shallow -- an average of 8 feet deep; 20 feet at the deepest -- which means the water is warm, just right for water sports particularly in the morning before the wind comes up, and windsurfing in the windy afternoon. Ennis Lake is located northeast of the Town of Ennis. Ennis Lake is accessible year round. Due to it shallow depth, the Lake freezes during the colder months and ice skating, ice fishing and other winter sports can be enjoyed both on its surface (with caution) and around the shore. On the lake, you can enjoy fishing, water sports, camping, and wildlife watching. Swimming: Areas are marked off by floating buoys near the lake's Kobayashi Bay. Canoeing, Sailing, Kayaking: Boaters can enjoy a free run of the lake and entrance to the river with non-motorized boats, including canoes, sailboats, rowboats, kayaks and even inflatables. 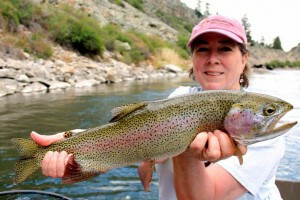 Fishing: Fish for Brown Trout, Mountain Whitefish, and Rainbow Trout. A fishing license is required. Camping: Meadow Lake Campground is primitive (with a vault toilet). It costs $7-12/night and is first-come first-serve. To access the campground, head east from McAllister, Montana on Ennis Lake Road. You'll run into the beach and campground. 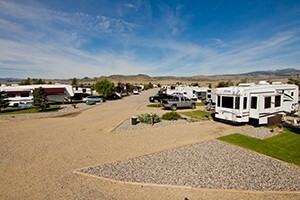 There is also an RV park nearby, but they do not allow tents. 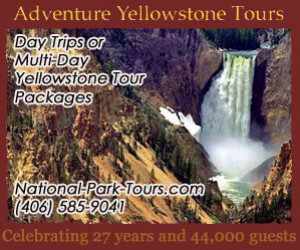 If you have an RV you can call Lake Shore Cabins & RV Park at (406) 682-4424. Scenic reservoir flanked by mountains, just outside of Yellowstone Park.